The cells of our body reproduce by dividing themselves in two. The daughter cells are (almost) exactly identical to the mother. When a cell divides, the chromosomes in the nucleus divide first. The DNA ladder splits lengthwise in the middle. Then each half pairs up with another half floating in the cell nucleus. Nucleotides pair up with matching mates (C with G, T with A).Then the chromosomes move to one side of the nucleus, while a ring forms around the middle of the cell, which then splits apart, creating two new cells, each with the same set of chromosomes in its nucleus. Cell division is also called ‘cloning’. 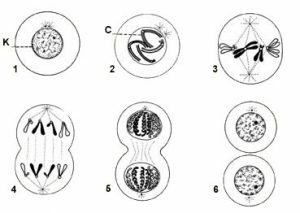 During our life time, there is a continuous process of cell division going on in all the different cells of which we are made. Every cell contains all the information about our whole organism (23 pairs of chromosomes), but each cell activates only those functions which make it into a particular kind of cell, such as a nerve or muscle cell, hair, liver, sperm, bone or brain cell. So when cells divide they make only clones of themselves, which can only be hair or muscle or any other type of cell. 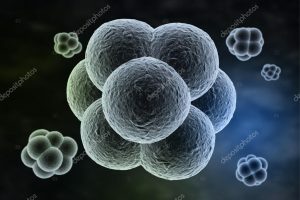 Only the so-called stem-cells in early embryos are not specialized: they can still program all the different cells of which we are made. Cell division, or cloning, is the oldest form of reproduction. Most larger organisms (plants and animals) reproduce sexually, which means that two sexes are required, female and male, to produce offspring. In sexual reproduction the female principle is, however, still predominant. Male cells are only required to add different DNA to the female cell, which then begins to divide.